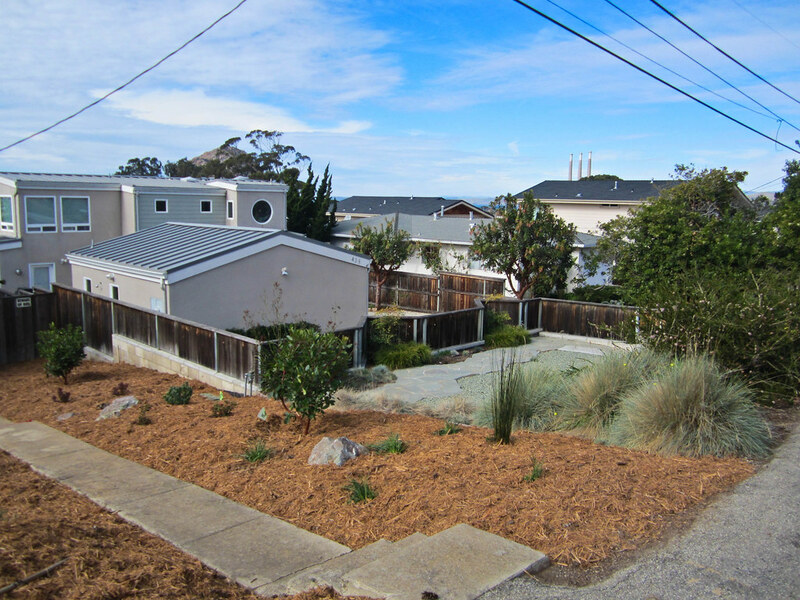 I went back to see my Morro Bay design the other day and the work is pretty much completed. OK the mulch is a bit much. 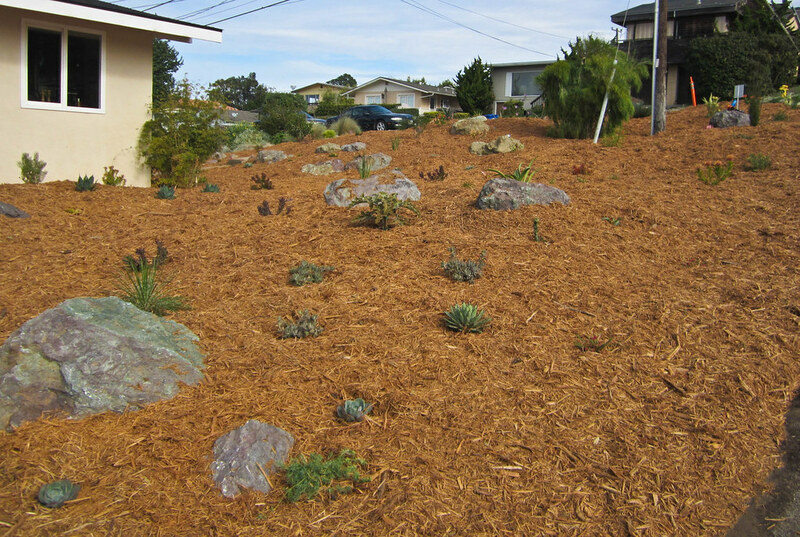 The homeowner went with shredded Eucalyptus because it is much cheaper. Once it gets a bit weather worn the color won’t be as intense. And of course once you take the plants out of their big pots and put them in the ground they seem tiny. 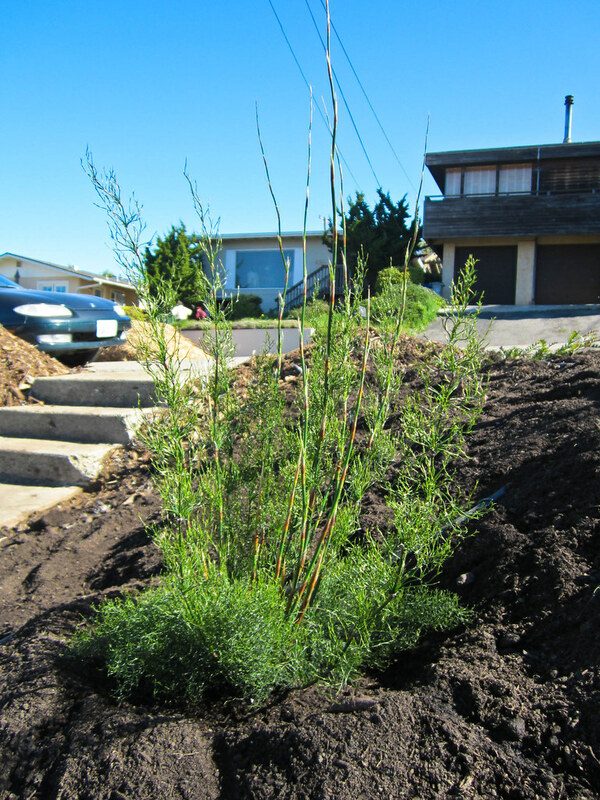 But most of these are shrubs that will get between three and ten feet tall. Morro Bay has a very long growing season so many of them will grow and fill in quickly. I look forward to taking some pictures in six to eight months and seeing how the garden is progressing. 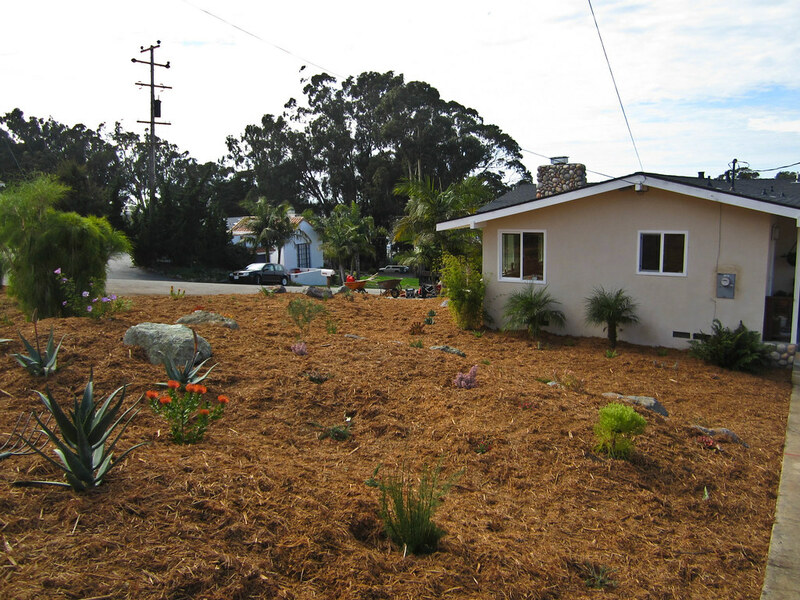 I would have preferred a gravel mulch for the succulent beds in front of the house but that can be quite expensive. 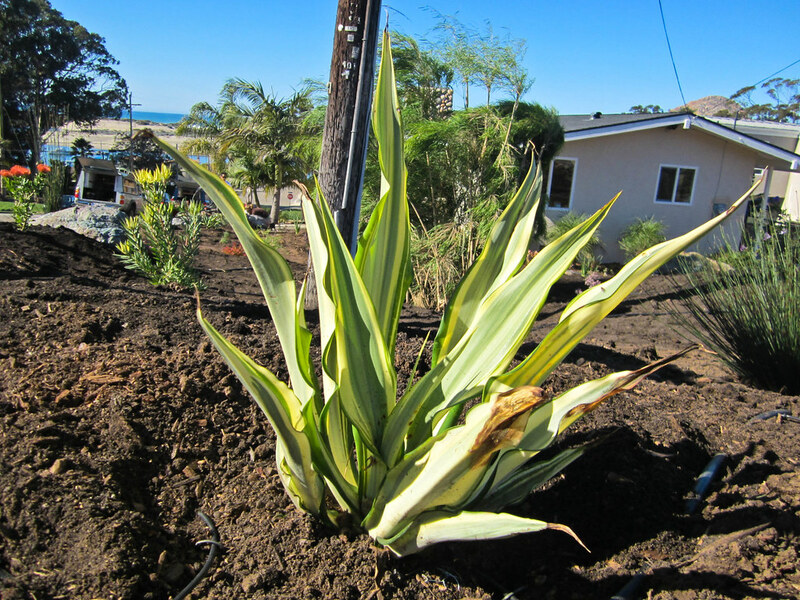 Once the plants will in and the mulch has faded this will look much more natural. I think in time this border will blend in nicely with the neighbors garden. Going back and looking at photos can highlight problem areas in your design. I see a Kniphofia that needs to be repositioned. 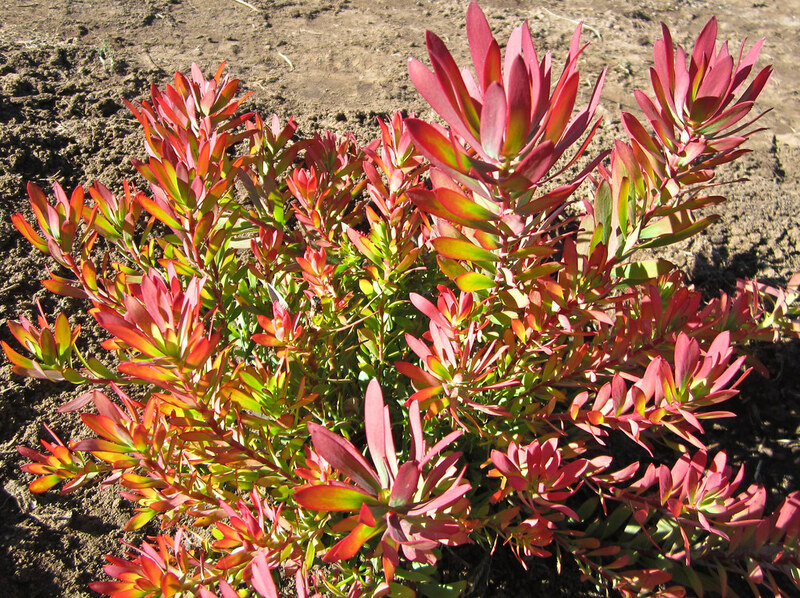 Leucadendron ‘Jester’. 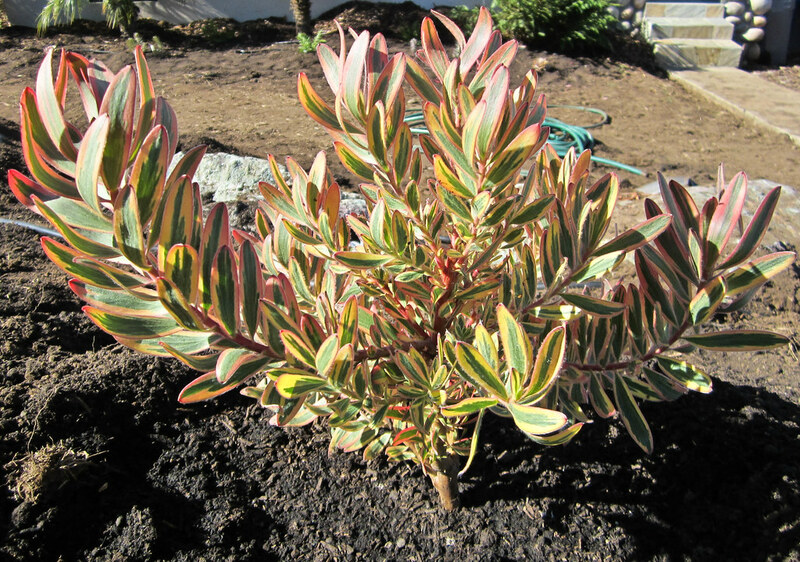 Usually I am not a fan of this type of variegation but I think this plant mixes well with other boldly colored plants. My original design specced four Chondropetalum ‘El Campo’ (a beautiful dwarf Native Sons selection) and a large Chondropetalum elephantinum. But then I saw some Thamnochortus insignus in a garden and decided I liked it better than C. elephantinum. Then five gallon C. ‘El Campo’ were not available. Only show quality specimens in fifteen gallon containers. That would be stunning but it would also have destroyed our plant budget. So we went with just one ‘El Campo’ and added the above Calopsis paniculata Rodocoma capensis and two Thamnochortus insignis instead. I think the variation will be nicer. When you design a garden you need to be ready to make substitutions and modify your design at the last minute. ETA: just a correction on the Restio pictured above. It is actually Rhodocoma capensis. We considered Calopsis paniculata but thought it would get too big for the spot so went with the Rhodocoma instead. When I design a garden on paper I always try to match colors to neighbors or even distant visible spots in the garden. It is hard to tell from the photos since the plants are so small now but I am pretty satisfied with the way my color scheme worked out in this garden. The variegated yellow of the Furcrea above is matched in yellow and green Leucadeondron ‘Ceres’ to its left. The orange flowers of the pincushion on the left edge of the photo is picked up in other pincushions strategically placed around the garden and the red leaved Leucadendron barely visible in the center and winter blooming Aloes (and I am hoping some Kniphofias will overlap as well since they have a very long bloom season here on the coast). I had originally specced Aloe wickensii for this spot but Gabe showed me these beautiful specimens of Aloe rubroviolacea from Yemen that he had in his backyard nursery and I made another design swap. I think their shape is more similar to the A. speciosa and A. ferox from my inspiration photo and they were also just really nice big plants. 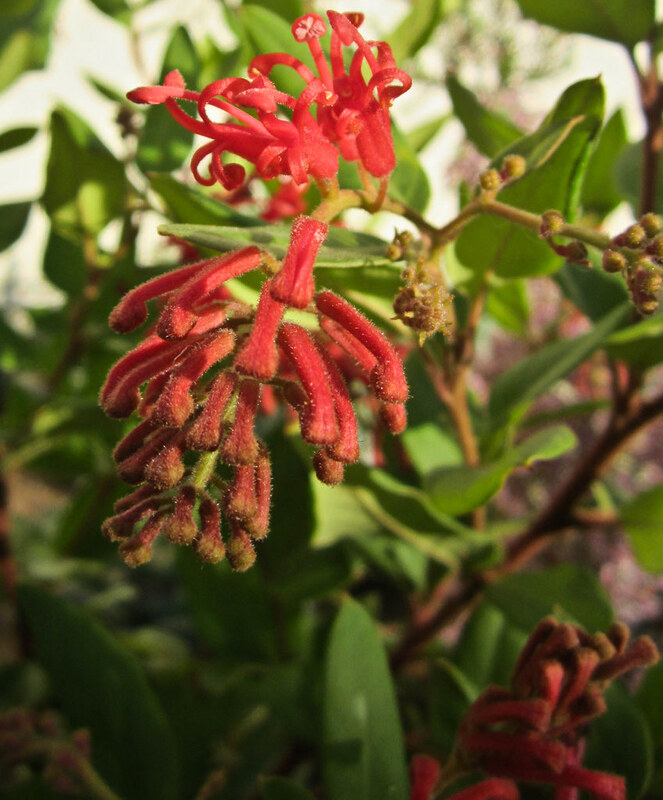 Grevillea rhyolitica (deau flame). I still have a lot to learn when it comes to Grevilleas but right now this one is my favorite. Gabe gave me one for my new garden! This has been a fun process so I look forward to sharing more pictures as this garden fills in. Hopefully over the next year everything will grow in and come together nicely and my design choices will be successful. 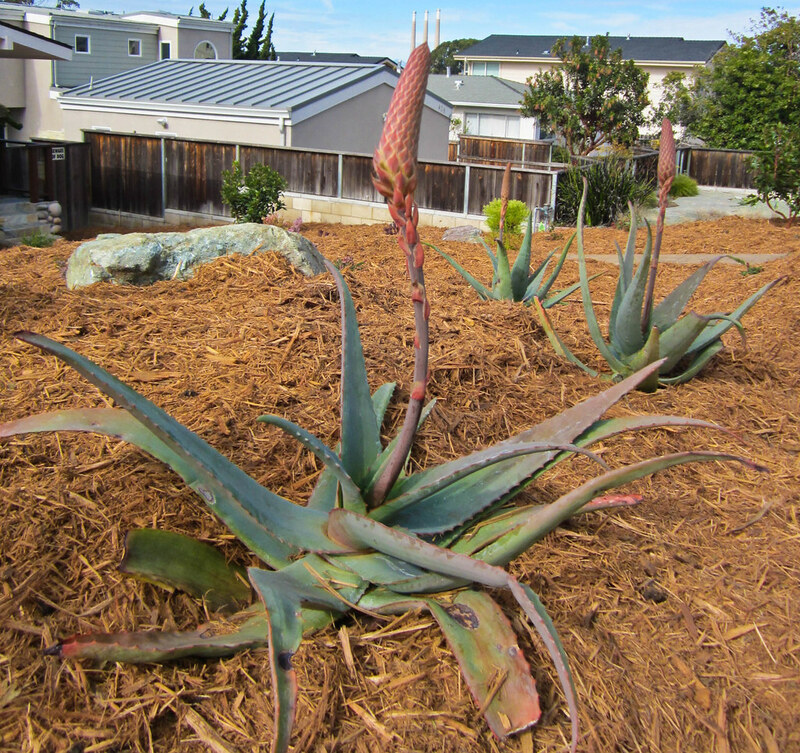 This entry was posted in California, Garden Design, Morro Bay, San Luis Obispo Landscape Design and tagged Aloe, Calopsis, Chondropetalum, color combinations, Furcraea, garden design, Gardens by Gabriel, Grevillea, Leucadeondron, mulch, Propaganda Garden Design, restio, San Luis Obispo Landscape Design, Thamnochortus by entire leaves. Bookmark the permalink. I am so glad you addressed the mulch issue right away, that first picture was a shocker. It seems odd to me that went to the expense of buying big rocks and renting a GRMT but yet didn’t buy gravel. It’s not that expensive! Anyway…the plant choices, lovely! And I look forward to your follow-ups as they grow and fill in. This was half the cost of regular mulch and gravel would have been even more expensive. Oh well. That gave us a bigger budget for plants.